Hello, I am having a strange problem since the latest Oculus/GearVR update (not sure which one it was ). When I click on a button in Editor it works as expected, same when running the app in dev mode on the phone. But when I put the phone into Gear VR, clicks/taps are executed twice. I tried debugging via Wi-Fi and adb printed debug text from the same function twice (looks like in different frames though). I am using OVRCameraRig, GazePointerRing (from sample framework) and OVRInputModule. 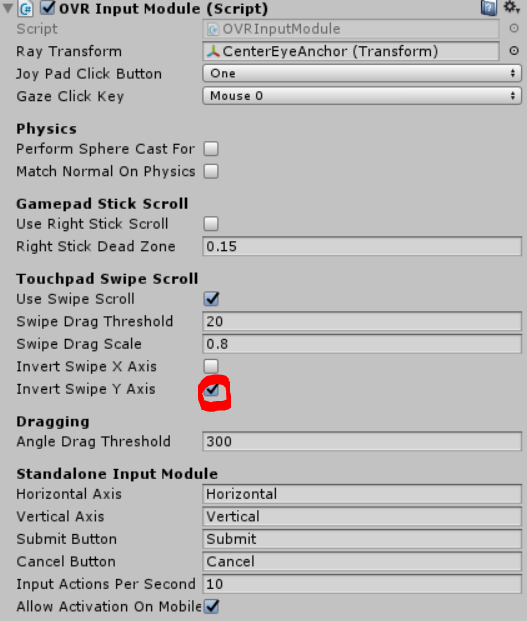 Buttons are standard ones from Unity's UI. I have two apps with this problem. One is made in Unity 5.4.2f2 (Oculus Utilities v1.9.0, OVRPlugin v1.8.0) and another in Unity 5.5.0f3 (Oculus Utilities v1.10.0, OVRPlugin v1.10.0). I tried to run older version of the app made in Unity 5.4.2f2 and it has the same porblem. I know that it worked before. You can see the OVRInputModule settings in the image below. "Invert Swipe Y Axis" setting was added by me but it doesn't affect clicks. Any help appreciated! I just wanted to add, that I created a new empty project in Unity 5.5.0f3 (Oculus Utilities v1.10.0, OVRPlugin v1.10.0). Same problem. When I take the phone from Gear VR I can see a notification about disconnected mouse. Is this normal? > when I put the phone into Gear VR, clicks/taps are executed twice. We recently added touchpad support to OVRInput and without the above check, you may get your gamepad button handling logic firing at unexpected times in addition to the usual touchpad handling code. If you are really getting duplicate touchpad input, make sure you don't have two copies of components like OVRTouchpad or OVRInputModule in your scene. First click prints None and immedeatelly after it prints Touchpad. Every click after that prints Touchpad twice. Checking if there are multiple copies of components mentioned above was the first thing I did. I made another empty project (Unity 5.5.0f3), imported Utilities 1.10 package and copied OVRHarness, OVRInspector and Parse folders from Oculus Sample Framework (1.5.1). I made an empty scene with OVRCameraRig, GazePointerRing and world space Canvas (with Graphic Raycaster disabled and OVRRaycaster enabled). EventSystem's standalone input module is disabled and OVRInputModule is enabled). I set up player settings for VR and clicks worked as they should. I noticed that I forgot to set Android API level (it was set to 9 - Android 2.3.1). As soon as I changed API level, clicks started to get called twice. I tried to change API back to 9 and it didn't work anymore. Then I cleared data and cache on the phone and installed the app again. Clicks started to work again. But I can't replicate this again. It worked only once, no matter how many times I change API or delete data/cache. Uninstalling and reinstalling also doesn't help. I updated Android SDK's, tools, platform tools, etc... It didn't help. Hello, sorry for late reply. Yes, I still have this problem. Okay, good to know.Thank you again for helping out! Confirming that the issue has been resolved using the latest Oculus Utilities (1.12). I'm Having the same issue now after upgrading to 5.6.0f3 with both Oculus Utilities 1.12 and 1,13. I am having this issue as well in Unity 5.6.0f3, and Oculus Utilities 1.14. Regular UI Buttons are being clicked twice. All I have in my scene is the EventSystem with the OVRInputModule, a Canvas with the OVRRaycaster, and a Button in the canvas, and I can see that the button click is most often than not triggered twice. Might be worth noting that every time I swipe, instead of click in center of the Touchpad, the button click is triggered once. With that said, though, I don't expect a click when swiping so this is another issue I am having. I had the same problem. I don't know what is official solution but you can try mine which works in my case. Go to OVRInputModule.cs script and change this method. //            // on Gear VR because on PC the mouse clicks are used for actual mouse pointer interactions. Hey SerFreeman, your solution works! Thank you very much!!! I'm still having the issue where a swipe is registered as a click as well, but that issue I can work around on. I have developing this for almost one and a half year.. they update new things and bring more problems that worked perfectly fine.. Its the same problem i am facing gets clicked twice on gear vr and swipe gets registers as click. Just set the gazeClickKey to Keycode.Space. So I'd get a click event on frame 55 from the press/release sequence, and then another on frame 57 from the second press/release sequence. Further digging and I noticed that OVRManager.Update() was running after Unity's EventSystem update on a given frame, which meant that OVRInputModule was processing input from OVRInput that hadn't been updated for the current frame. So I changed the script execution order for OVRManager from -100 to -31122 (an arbitrarily large choice), and then OVRManager.Update() ran first, which pumped OVRInput.Update() and got all the button states correct for the frame before the Unity EventSystem updated. This meant that Input.GetMouseButtonUp() and OVRInput.GetDown() were true on the same frame, which by the OVRInputModule logic meant I got a click event on that frame, but it did not start a new event sequence, and the OVRInput.GetUp() on the next frame did not trigger a second click event.